"Quick and delicious entrée with all the burrito ingredients you want, minus the tortilla. Served with a side salad, it's a complete meal." Heat a non-stick skillet over medium-high heat. Cook and stir ground beef, onion and bell pepper until beef is browned and onion is translucent, about 5 minutes. Stir in cumin and chili powder. Remove mixture from pan with a slotted spoon and set aside. In same skillet, prepare Knorr(R) Rice SidesTM- Beef flavor according to package directions. 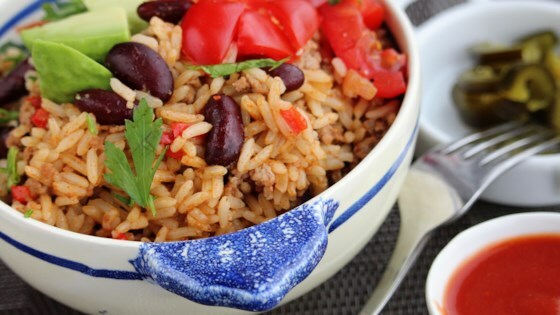 Stir pinto beans and seasoned beef mixture into the rice; continue cooking until thoroughly heated, about 2 minutes. Reduce heat to low. Top with Cheddar cheese and continue cooking until cheese melts. Serve with sour cream and any additional favorite toppings. I use 1/2 green bell pepper and 1/2 red bell pepper. I used Bush's Fiesta style black beans--excellent! Very good! Had trouble finding the Knorr's rice side dish, just added a frozen rice and veggie side. Quick easy dinner! My family enjoyed this. I used plain brown rice and red and yellow pepper instead of green. Served with all our regular taco fixings...sour cream, salsa, lettuce, tomatoes. I added red and yellow bell peppers only half each and taco seasoning and put it on tortilla open faced it was yummy!! This is pretty darn good. You can doctor it up like you want. Thank you for the recipe.